The 2017 Opening Night roster for the Tulsa Drillers has been finalized. Thirteen players who donned the Drillers uniform in 2016 will return to begin the year with the club, while several new and intriguing names will also be on manager Ryan Garko's roster. Continuity seems to be the theme for this year's club as 20 of the 25 players on the Drillers roster played in the Dodgers organization at one level or another in 2016. Highlighting the returning Drillers from 2016 will be infielder Edwin Rios. Rios will look to pick up where he left off last season as he was honored as the Los Angeles Dodgers 2016 Minor League Player of the Year after hitting a combined .301 with 27 home runs and 76 RBI's in just 108 games. Other familiar names joining Rios on the Drillers to start the year will be position players Kyle Farmer, Paul Hoenecke, Tim Locastro, Kyle Garlick and Jacob Scavuzzo. Farmer, Hoenecke, Garlick and Scavuzzo should all bring plenty of firepower back to the lineup as the quartet combined for 45 home runs last year. Meanwhile, Locastro should provide a spark at the top of the lineup after hitting a combined .285 with 24 stolen bases last season. On the pitching side of things, Drillers fans will recognize Isaac Anderson, Scott Barlow, Joe Broussard, Ralston Cash, Michael Johnson, Tim Shibuya and Yaisel Sierra as each hurler donned the Drillers uniform at one point in 2016. Barlow was a key member of the Drillers rotation as the right-hander was a first-half Texas League All-Star while making 23 starts for Tulsa on the season. Broussard, Cash, Johnson, Shibuya and Sierra return as each player projects to be a key arm coming out of the bullpen. 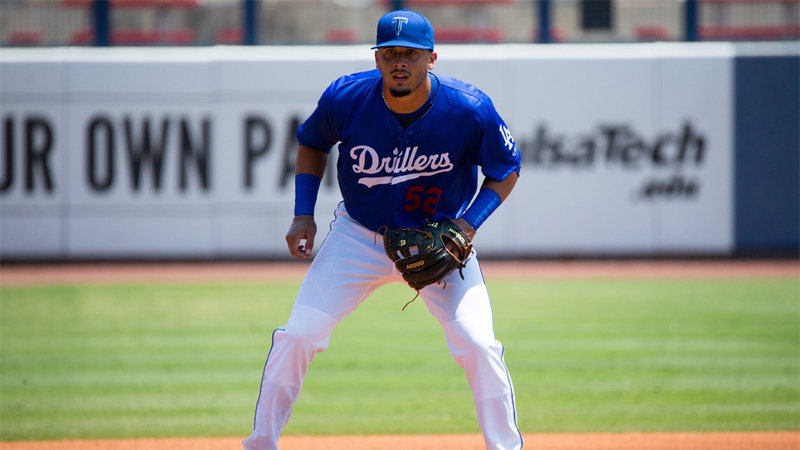 The new faces on the Drillers roster are highlighted by infielder Jose Fernandez and outfielder Johan Mieses. Fernandez will be making his debut in the U.S. after being signed by the Dodgers out of Cuba earlier this offseason. But the 28-year-old infielder is not the typical rookie as some baseball analysts believed he could have opened the year as the starting second baseman for the Dodgers. Similar to Cody Bellinger in 2015, Mieses had a breakout season last year in Rancho Cucamonga as the Dominican Republic native clubbed 28 home runs and drove in 78 RBI's. Other newcomers on the position player side of things will be Wynston Sawyer, Mike Ahmed, Matt Beaty and Stetson Allie. Ahmed and Beaty were teammates at Rancho Cucamonga last year as the duo combined for 30 home runs and 140 RBI's. Power should be plentiful in the lineup and off the bench for Tulsa in 2017 as Rios, Garlick, Scavuzzo, Mieses, Sawyer, Ahmed, Beaty and Allie all finished with double digit totals in home runs last season. The list of pitchers appearing on the Drillers roster for the first time will be Corey Copping, Colt Hynes, Karch Kowalczyk, Edward Paredes, Layne Somsen and Ivan Vieitez. Although this is his first time on the Drillers roster, Paredes is no stranger to ONEOK Field as the southpaw reliever pitched for the Arkansas Travelers last year, going 2-2 with a 2.27 ERA over 46 relief appearances. Speaking of familiar surroundings, 2017 will mark a homecoming of sorts for Copping as the reliever pitched for the University of Oklahoma from 2013-15 before being drafted by the Dodgers in the 31st round following his junior year. Hynes boasts the most big league experience on the roster as the Oklahoma City native pitched in 22 games for the San Diego Padres in 2013 and in 5 games for the Toronto Blue Jays in 2015. Somsen has the most recent Major League Baseball appearance though as the South Dakota State product pitched in a pair of games for the Cincinnati Reds this past season. To view the entire Drillers roster for 2017, click HERE. Texas League teams can carry 25 active players throughout the season. The Drillers will open the 2017 regular season on the road in Midland, Texas this Thursday night as they take on the RockHounds at 7:05 PM for the start of a six-game road trip. The home opener for Tulsa will be exactly one week later on Thursday, April 13 when Midland will come to town. First pitch for the home opener at ONEOK Field is also scheduled for 7:05 PM.